Product prices and availability are accurate as of 2019-04-10 10:38:12 UTC and are subject to change. Any price and availability information displayed on http://www.amazon.co.uk/ at the time of purchase will apply to the purchase of this product. 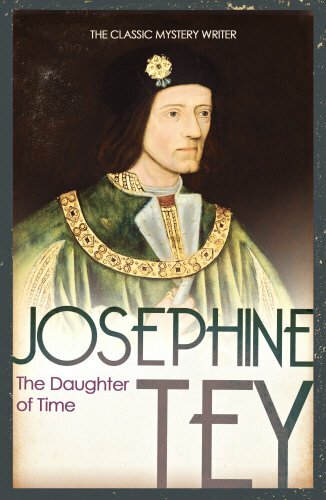 Josephine Tey's classic novel about Richard III, the hunchback king, whose skeleton was discovered in a council carpark, and who was buried in March 2015 in state in Leicester Cathedral. The Daughter of Time investigates his role in the death of his nephews, the princes in the Tower, and his own death at the Battle of Bosworth. Richard III reigned for only two years, and for centuries he was villified as the hunch-backed wicked uncle, murderer of the princes in the Tower., Josephine Tey's novel The Daughter of Time is an investigation into the real facts behind the last Plantagenet king's reign, and an attempt to right what many believe to be the terrible injustice done to him by the Tudor dynasty. Inspector Alan Grant of Scotland Yard, recuperating from a broken leg, becomes fascinated with a contemporary portrait of Richard III that bears no resemblance to the Wicked Uncle of history. Could such a sensitive, noble face actually belong to one of the world's most heinous villains - a venomous hunchback who may have killed his brother's children to make his crown secure? Or could Richard have been the victim, turned into a monster by the the Tudors? 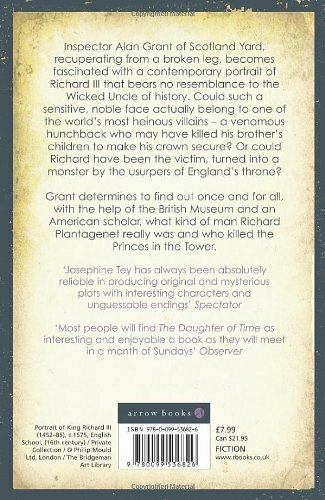 Grant determines to find out once and for all, with the help of the British Museum and an American scholar, what kind of man Richard III really was and who killed the Princes in the Tower.